Teaching Homeschool Music Appreciation has been a struggle for me because I have no formal musical background, but recently we started using Music Appreciation I from Memoria Press and I feel like I can successfully teach it! I’m so happy to share my review of Music Appreciation I with you. My children seem to have some musical inclination and even a bit of talent, so I want them to have the opportunity to know some musical theory. Is Homeschool Musical Appreciation Too Hard for Elementary School? 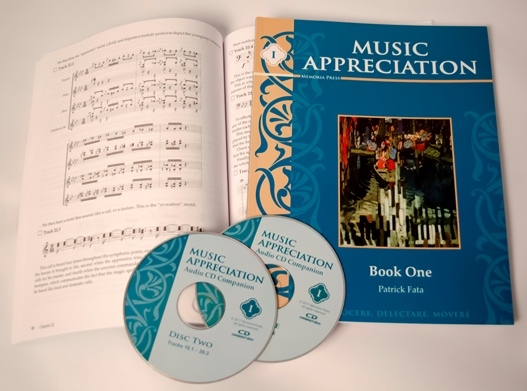 When I received my book and CD for Music Appreciation I, I wondered how much my children could get out of it. It seemed so advanced. My children were 5, 7, and 10 when we began the curriculum. They have some musical background. We listen to music a lot, my girls take dance. Despite my own musical fumbling, and my lack of formal musical training, my children can all play some piano songs and are even starting to read a bit of music. There is no student workbook, so I was able to use the curriculum easily for all three of my children. I did our lessons as a group so all three of them were included. The lesson are set up so that I read through the history lesson, and played the CD tracks that correspond to areas of the lesson. After each lesson, I played the full track of the songs, which are linked on the website for Music Appreciation I. The lessons really held their attention. Even my littlest, who is so squirrely! My girls (ages 5 and 7), spent most of each lesson either dancing or waiting for the opportunity to dance along with the music. My son, who is 10, listened quietly. I’m keeping my children to one lesson per week, which takes about twenty minutes for us to complete. If my children had their way, I think we would do all the lessons in just a few days. They never want to stop. The lessons are very clear. They focus on just a bit at a time. The lessons relate an easier piece of music (such as a lullaby), with clips of a complicated musical composition. The breadth of the lesson is very small, but they go very deep. I think that’s why even though the lesson looks like it would be difficult, we were all able to get a lot of out of the lesson. I learned a lot from the lessons even though I’m sure I’m well out of the range of the target audience! Clearly, each age level will get different things out of the lesson. My 10 and 7-year-old children could understand that there is a Baroque period for music, and they could relate that to what they know about history during that same time period. My kindergartener isn’t running around telling me about the Baroque period, but she understood, for example, the characteristics of how to recognize a piece of music from the Baroque period. She ran around for a week trying to imitate the changes. All of them are starting to understand that there are rules to musical composition – there are reasons behind why certain pieces of music sound “good” or “bad,” or why they make you feel a certain way. My 10-year-old is a big fan of math, and he enjoys the mathematical aspect of music. I know enough about most subjects to be able to teach them well without a lot of hand-holding. Music appreciation is a subject where I need serious hand-holding. I got that with Music Appreciation I From Memoria Press. Don’t worry about your lack of musical background! This curriculum makes it very easy to homeschool music appreciation. Memoria Press has a lot of other curriculum options. We haven’t gotten to Latin yet because my kids are in their 5th year of Chinese and chose to start French recently, too. 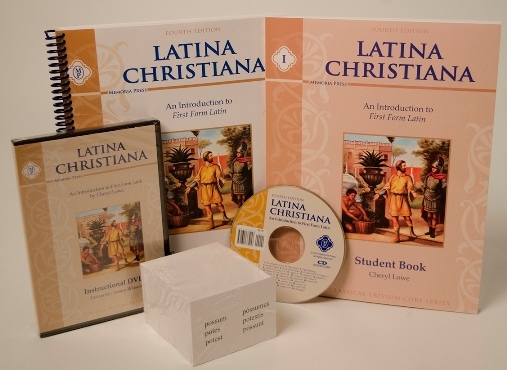 I am planning to introduce Latin in 8th or 9th grade with my oldest, and I’m really interested in using Latina Christiana. That’s a few years away for us, but it never hurts to keep an eye out for the future. I agree that no music background is needed to teach or use this course! And that it really is a match for a variety of ages. My own 7 year old didn’t remember squat about the musical forms or the eras–but he remembered that Bach only played a piano once and had 20 children. Or that Vivaldi liked to put music to stories and had red hair. LOL. I’m so glad to hear that your younger kids liked it as much as mine did!